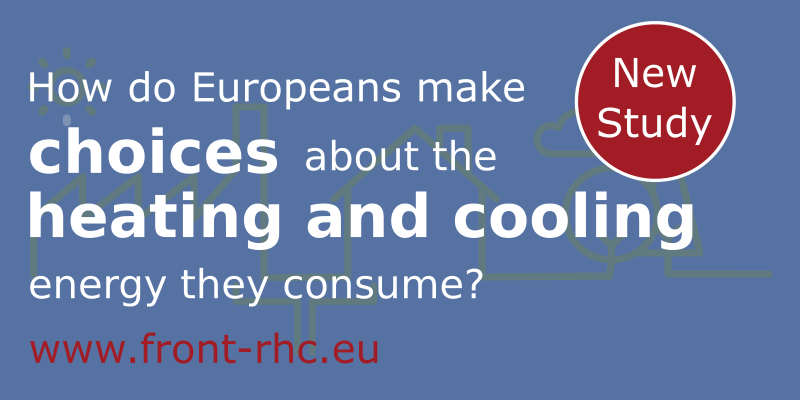 The behaviours and attitudes of European consumers towards the heating, cooling, and hot water systems they use have been analysed in a study of more than 5500 participants representing private households, tertiary buildings, and industry. The study examined why current systems are used, where users get information about thermal energy, why they choose some systems rather than others, how they perceive different sources of energy, and their sensitivity to price changes. The research was conducted by a consortium of public authorities and renewable energy groups as part of the FROnT project. The research was conducted in order to provide public authorities and businesses with information about how to effectively communicate with their audiences about the energy choices they make, and to better understand how a shift to renewables can be achieved. Some clear trends were found from the data collected in the Netherlands, Poland, Portugal, Spain, and the United Kingdom. For all sectors, professionals are the main source of information but private users also rely heavily on the advice of their relatives. Total economic savings is one of the most important factors when choosing a system; it’s the most important factor for the residential sector and the second most important for others, coming just behind reliability. Private households: The least aware of Renewables. Most private households are happy with their systems, especially when using gas or biomass – those using electricity and oil are the unhappiest. They care a lot about comfort and ease of use, and are mostly unhappy about fuel prices. Most get information from professionals, especially those in Spain, rural areas, and ages 41-49; the internet is the best way to reach British, Polish, and young people, and those with higher than average incomes. 65% of this group are familiar with renewables, of which men are more aware than women; solar thermal is the most known technology, followed by biomass. Most of the people aware of renewables for heating and cooling would consider switching, and 50% would pay more. Men with a university education are the most likely to switch, and women in multifamily dwellings in city centres the least. Tertiary building managers: Looking for reliability and Safety. The use of renewables for heating and cooling is very low in this sector. Most systems are in use because they are already in place or because of imposition by superiors. Legal obligations have little impact. Information from energy agencies is sought most by managers of public buildings and the healthcare sector, whilst the internet is also important by managers of office buildings and in the public sector. They care most about reliability and safety, and total economic savings. Spanish and Dutch people are the least likely to think that renewables are safe, Dutch and Polish people are more likely to think installers of renewables are less specialised, and Spanish and Polish are more likely than others to think a high initial investment is required. 88% of this group are familiar with renewables for Heating and cooling, which they perceive to be eco-friendly, implying high savings, and requiring high investment. Most people are happy with the systems they have in place, but those with seasonal produce are the unhappiest. Respondents were happy with system adaption to process and ease of use, but are most concerned about equipment and fuel price. For cooling, electricity is most commonly used. 76% of this group are familiar with renewables for heating and cooling; the most aware industries are wood related, and textile and clothing whilst the least are metals, and rubber and plastic. The FROnT project promotes a level playing field for Renewable Heating and Cooling (RHC) in Europe and develops strategies for RHC deployment, and improved understanding of the costs of RHC vs fossil fuel use. It is funded under the EU horizon 2020 programme.